A mace was a club or staff used in the Middle Ages as a defensive weapon. It had a spiked head that could penetrate a suit of armor and could be used against a foe in hand-to-hand combat. 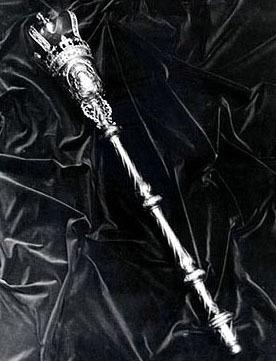 Later the mace, often made of precious metal and decorated with jewels, came to be merely symbolic of power or authority. It was carried by a mace bearer in procession before a public official or laid on a table before a legislative body. Governors of some of the American colonies seemed to have considered use of the mace to be significant in reflecting their position as a representative of the Crown. The earliest mace bearer noted in North Carolina records was Daniel Dupree (or Dupee), recommended for the post by the colonial Assembly in October 1756 and commissioned by Governor Arthur Dobbs. Whether North Carolina acted before its southern neighbor to acquire a mace is not known, but the South Carolina mace, which it still owns, was made in that year by a London goldsmith, Magdelene Feline. In 1760 the North Carolina Assembly was one member short of having a quorum present when an important vote was about to be taken. The member was at home ill, so the Speaker, accompanied by the mace bearer, went to the bedside of the absent member to record his vote. With the beginning of the American Revolution, the mace ceased to be used in any official way. William S. Powell, ed., Correspondence of William Tryon and Other Selected Papers (1980-81). Mace of the South Carolina House of Respresentatives. Image courtesy of the South Carolina Encyclopedia. Available from http://www.scencyclopedia.org/ (accessed July 12, 2012).